At the beginning of the 19th century the clothes of most people, whether rich or poor, were handmade, either at home or by professional tailors and dressmakers. By the end of the century, however, clothes such as shirts and trousers were being mass produced and sold to standard sizes for the first time. For reasons of fashion and mild sartorial prejudice many people still preferred to buy handmade clothes. 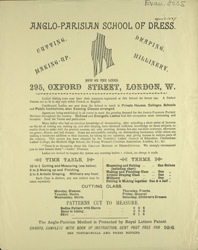 This leaflet not only advertises the dressmaking skills of the firm's employees but also offers a tuition service, teaching women how to sew in "English" and "French" styles.